"There should not be a practitioner who does not have a copy ... highly recommended." 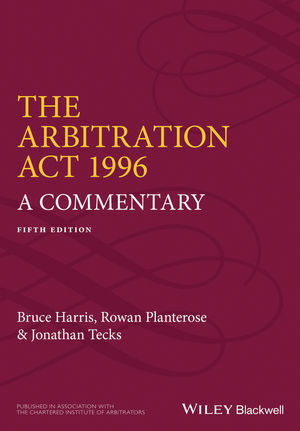 When first published, The Arbitration Act 1996: A Commentary was described by Lord Bingham as "intensely practical and admirably user-friendly". It remains the most readable, useful, practical and user-friendly guide to the Arbitration Act 1996. The courts – particularly the Commercial and the Technology & Construction Courts – continue to grapple with many questions relating to the Act, with many judgments reported since the previous edition was published. While many of these do not add to the wisdom on this legislation, for the fifth edition the authors have considered some 330 new cases, resulting in extensive changes throughout much of the commentary. Many of the cases going to court concern challenges to awards and as a result the commentary on the relevant sections of the Act (ss. 67, 68, 70 and 72) has been subject to very substantial revision indeed. The details of all of these changes are of great importance to practitioners, whether lawyers or arbitrators. In addition there have been some significant changes to the Model Law since publication of the previous edition, which are fully documented and commented upon. Alterations to the CPR, the new UNCITRAL Rules (2010), the new ICC Rules (2012) and the new ICE Arbitration Procedure (2010) are also covered. Written by three practising arbitrators, the fifth edition continues to be the essential handbook for all concerned with English arbitration. Bruce Harris is a full-time commercial and maritime arbitrator who has been involved in close to 10000 arbitrations and made more than 2000 awards. Rowan Planterose is a former practising barrister, now a solicitor, Chartered Arbitrator, adjudicator and a partner at DAC Beachcroft LLP.